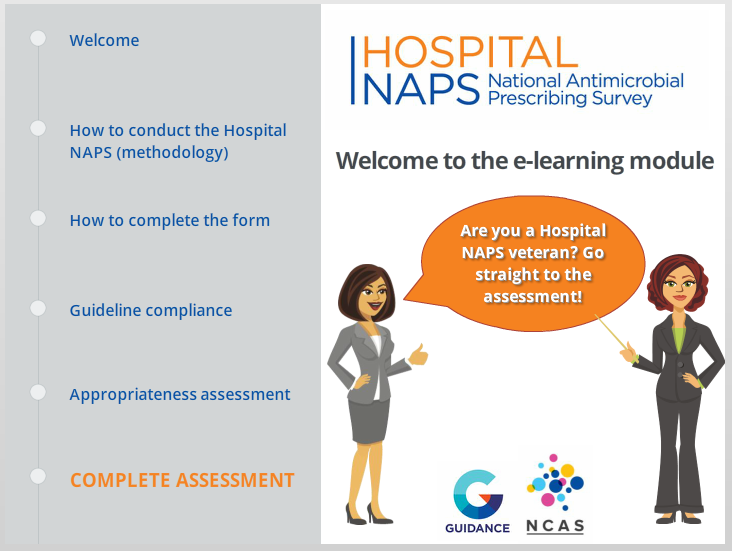 The NAPS is coordinated by a multi-disciplinary team at the National Centre for Antimicrobial Stewardship, and is delivered by the Guidance Group. This survey has been in use since 2011 and has already helped hundreds of Australian Health Care Facilities to assess their antimicrobial prescribing practice. It provides valuable information on the utilisation of antimicrobials within Australia and since 2013 the Australian Commission on Safety and Quality in Health Care has provided a funding contribution for the development of the NAPS program for the AURA Surveillance System. If you are brand new to NAPS, please Register here. If you do not receive a vertification email, check your junk or spam folder. login to the NAPS, go to 'My Account' then 'My Facilities', scroll down to 'Register for additional facilities'. If you are experiencing any problems registering, please Contact us for assistance. All reports for the Hospital NAPS and Aged Care NAPS are publically available. Click here to view. The eLearning module and assessment quiz are now available. Please note that you will need to successfully complete the assessment quiz in order to be able to finalise patient data. Click here to complete now.